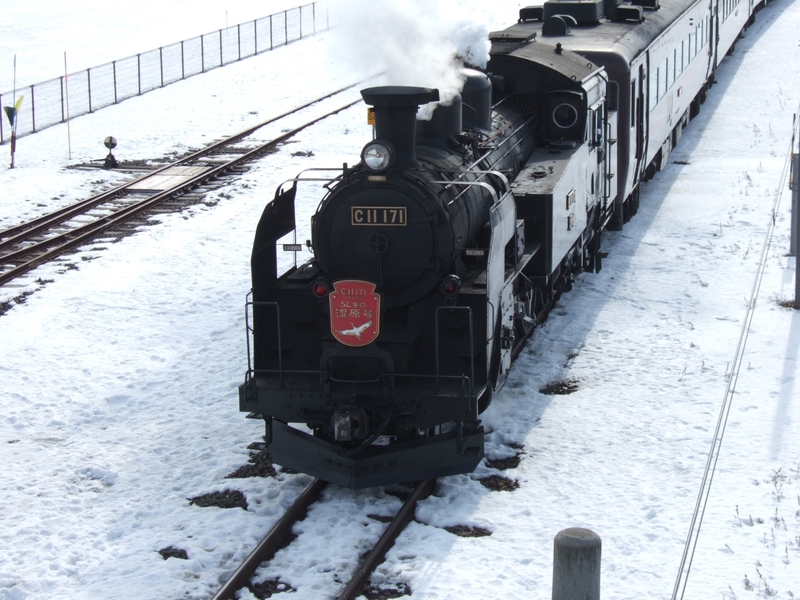 JR Hokkaidō's SL Winter Shitsugen Operates between Kushiro & Kawayu Onsen on the Senmō Main Line on Weekends & Holidays from January to March. C11 171 & C11-207 are allocated to the service. 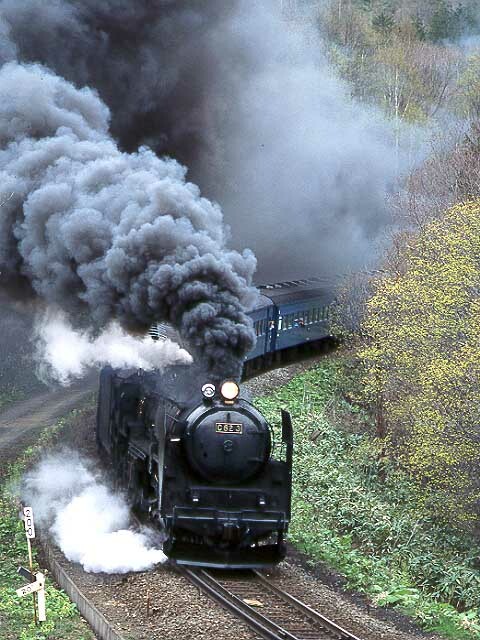 This is the only remaining steam operation on the whole of Hokkaido following budgetary cuts in mid 2014. JR East Ban'etsu Monogatari Gō (The Tale of Ban'etsu: Ban'etsu is a combined name of two geographic regions adjacenting each other, Iwaki and Echigo.) - the 1999 addition to steam operations. Operates on JR East's Ban'estu West Line, about 270 km north of Tōkyō on Saturdays and Sundays over 110 kms. Journey time is about 3 hours and 20 minutes, going across green landscapes surrounded by densely forested mountains and mostly along the scenic gorge of the Agano River. The operation period is from April through December. Haulage is by Niitsu based 1946 built 4-6-2 Pacific C57 180. 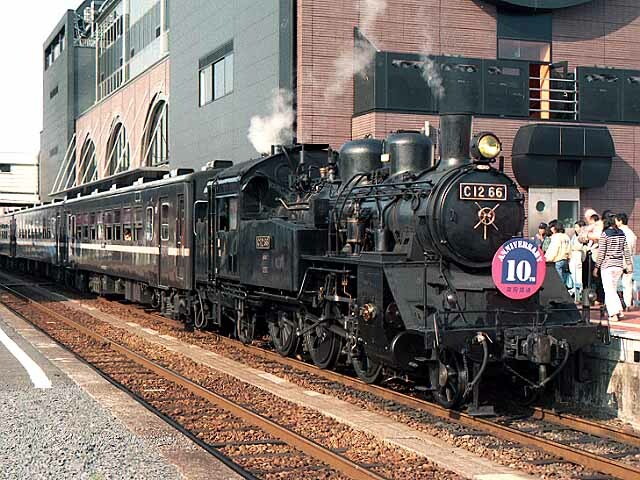 Photo: C57180 rolls past Gosen station hauling the "Ban'etsu Monogatari Gō," by Hiroshi Naito May 1999. 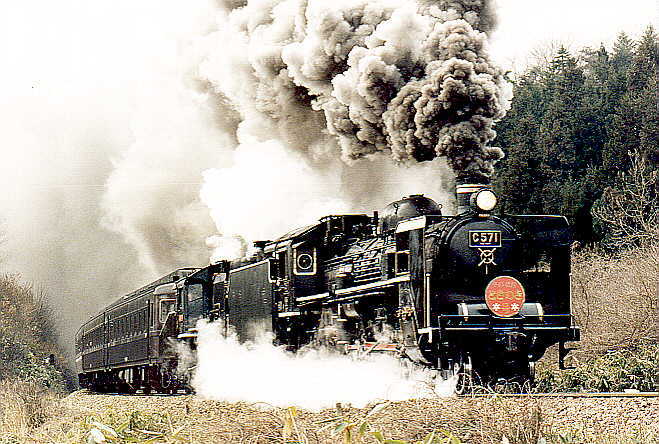 Hiroshi Naito's Steam Engine C11325 on Mooka Railway. 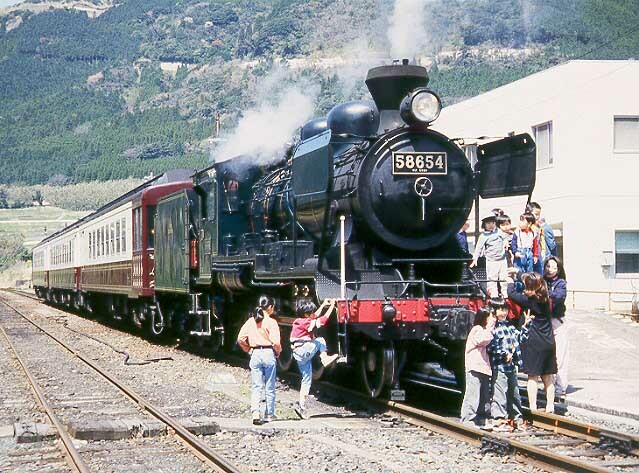 Photo: C1266 at Mooka station, by Anthony Robins. 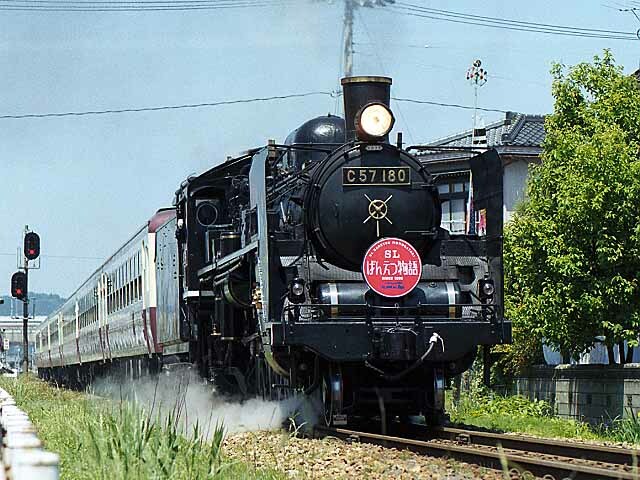 Chichibu Railway's Paleo Express - 1944 built 2-6-2 C58 363 operates one service on Sundays, holidays and some Saturdays on the Chichibu Railway between Kumagaya (JR East's Takasaki Line, Jōetsu/Nagano Shinkansen) and Mitsumineguchi. The locomotive is maintained by JR East at Takasaki. For more detailed information, refer to Hiroshi Naito's Chichibu Railway report. Journey time: 156 to 163 minutes from Kumagaya, 135 to 142 minutes from Mitsumineguchi. JR East's SL Minakami Gō - 1940 built 2-8-2 D51 498 operates services on some weekends between Takasaki and Minakami, a 59.1 kms section of JR East's Jōetsu Line. This service has run on occasion as the Okutone-Gō, Ozashiki Yutori-Gō & White Christmas-Gō. The service also occasionally runs as the EL Minakami using classic Electric Locomotives from the EF55, EF58 & EF64 classes with some services being worked by both Steam & Electics. Journey time: 104 minutes from Takasaki, 99 minutes from Minakami. JR East's SL Usui Gō - Uses similar equipment to the SL Minakami above, however operates on the remaining section of the Shin'etsu Main Line between Takasaki & Yokokawa on a seasonal basis. JR East's SL Ginga Gō - A recent SL service launched in April 2014 features C58 239 hauling a 4 car set of former KiHa 141 DMU's rebuilt as passenger cars on the JR East Kamaishi Line between Hanamaki (JR East Tōhoku Main Line) and Kamaishi. C58 239 itself spent many years in a Morioka Park as plinthed locomotive before being selected by JR East to be returned to service following an extensive restoration. The service was launched in a bid to boost tourism in one of the areas that bore the brunt of the 2011 Tōhoku earthquake and tsunami. The service presently runs on a seasonal basis. 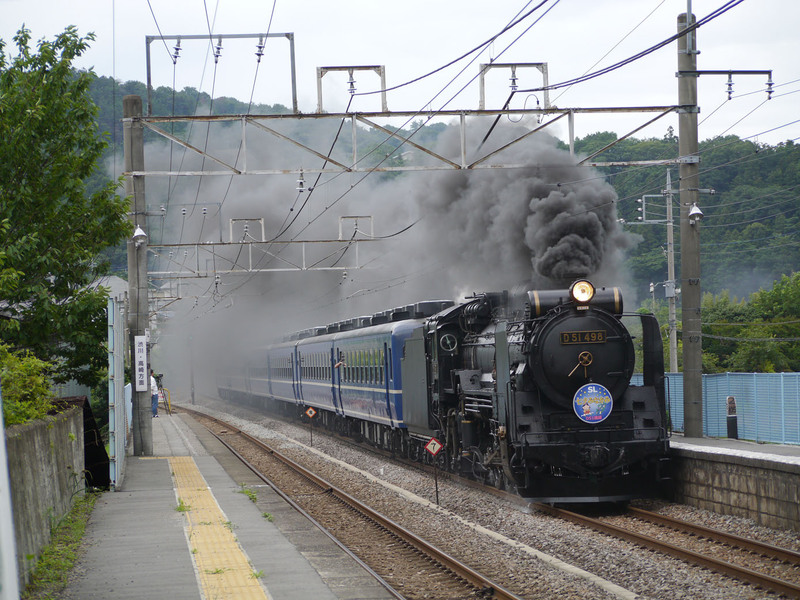 JR West's SL Kita Biwako Gō (North Biwa Lake) - a relatively recent addition to steam operations. Operates on certain Saturdays and Sundays over 22.4 kms (JR West Hokuriku Main Line from Maibara to Kinomoto). Journey time 50 to 58 minutes. 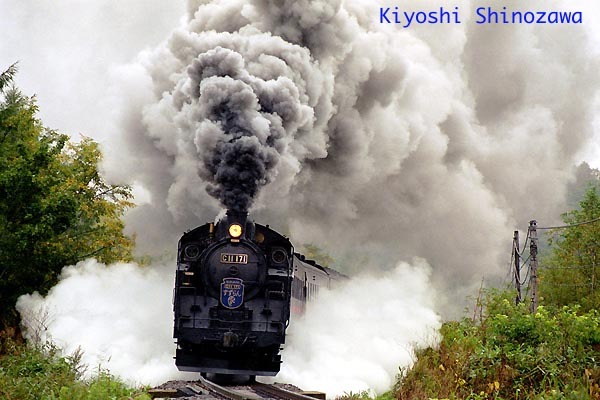 Haulage is by Kyoto based 1937 built 4-6-2 C57 1 and/or 1939 built C56 160, when not in use on the service below. JR West's SL Yamaguchi Gō - 1937 built 4-6-2 operates over 62.9 kms of the Yamaguchi Line between Shin Yamaguchi (known as Ogōri until 2003) to Tsuwano at weekends, sometimes double-heading with 1939 built 2-6-0 C56 160. Journey time: 120 minutes from Ogori. 99 minutes from Tsuwano. Information about the service running timetable can be found at http://www.c571.jp (Japanese Text). UPDATE: As a result of heavy rain in Western Japan in June & July 2018, service on many lines has been disrupted due to damage to right-of-way. Be sure to check the latest information before planning any travel to the area. 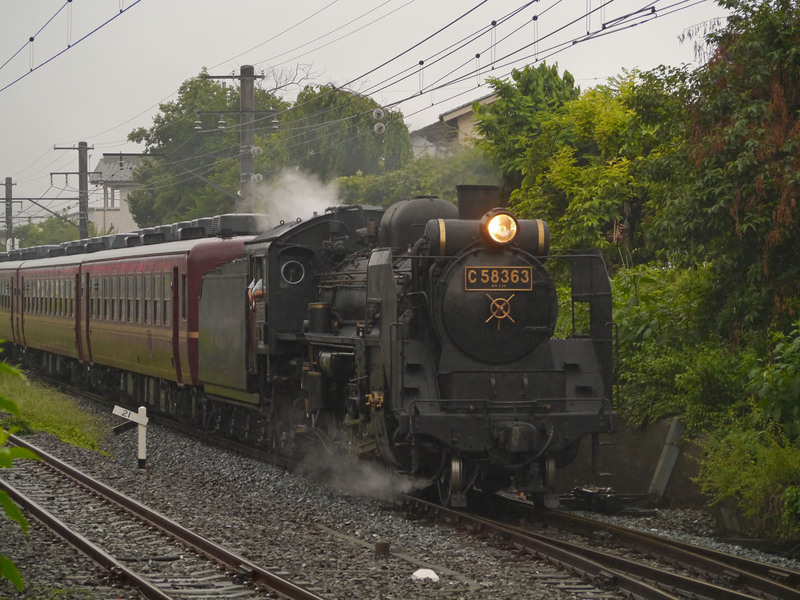 Photo: C57 1 with C56 160 on the Yamaguchi Line, by Carl Miller. 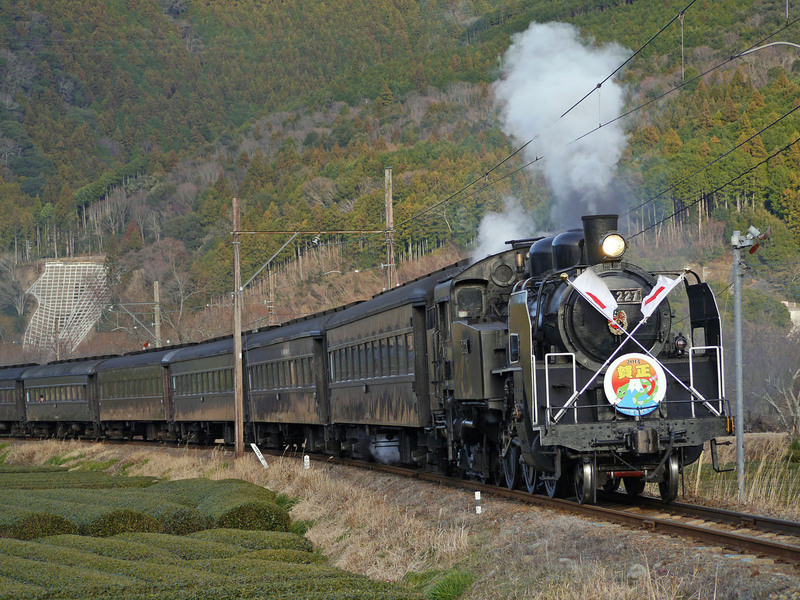 JR Kyūshū SL Hitoyoshi Gō- Runs from Kumamoto to Hitoyoshi most weekends and public holidays over an 84 km distance, the first 33 kms over the Kagoshima Main Line, the remainder on the challenging and scenic Hisatsu Line. Journey time is 2.5 Hrs in each direction with a 2 hour break at Hitoyoshi. 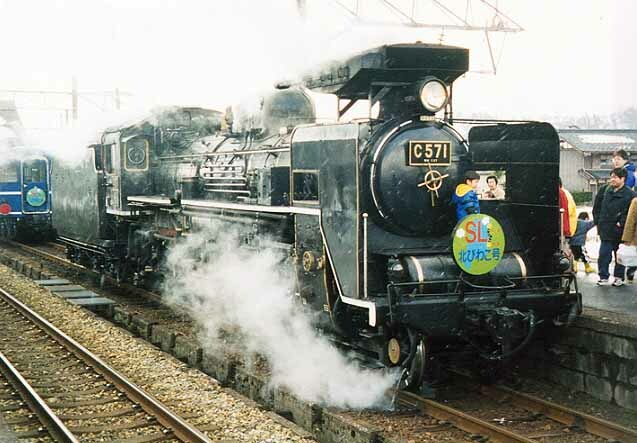 The service is operated by locomotive 58654, which previously operated the 'SL Aso Boy Gō' (see Section 'Former Operations' below). These Steam services were previously described as active on our website, however they have since ceased operation. JR Hokkaidō's SL Hakodate Ōnuma Gō - Commencing service on the 28th April 2001, the service ran between Hakodate & Mori on the Hakodate Main Line. The line in this area features two deviations to avoid severe gradients facing Down (towards Sapporo) trains on the original route via Nagareyama Onsen. Down trains travelled via the deviations to Mori, Up trains returned via the original route. The journey took approximately 2 hours in each direction with a 3 hours lay-over at Mori. Service ran Weekends & Holidays in July & August. This service ceased operating from the final runs in 2014. JR Hokkaidō's SL Niseko Gō - Operated between Sapporo & Rankoshi on the Hakodate Main Line on Weekends & Holidays in September & October. C11 171 & C11-207 are allocated to the service. Note: This service ceased operating from the final runs in 2014. 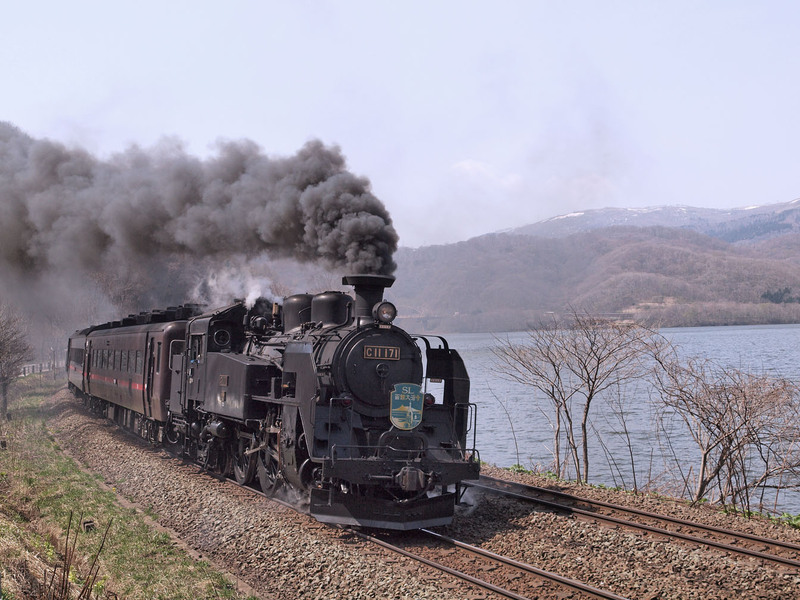 Photo: C11 171 rolls along an up-gradient hauling the "Suzuran Gō," Photo by Kiyoshi Shinozawa. C62 Niseko Gō - Operation of this train between Otaru and Niseko (Hakodate Main Line) ceased on 3rd November 1995, as the 4-6-4 C62 locomotive, C62 3 required an extensive and costly overhaul. JR Kyushu SL Aso Boy Gō- 1922 built 2-6-0 58654 operated over 58.7 kms of the Hōhi Main Line from Kumamoto to Miyaji. Operation ceased with the last run on 27th November 2005. 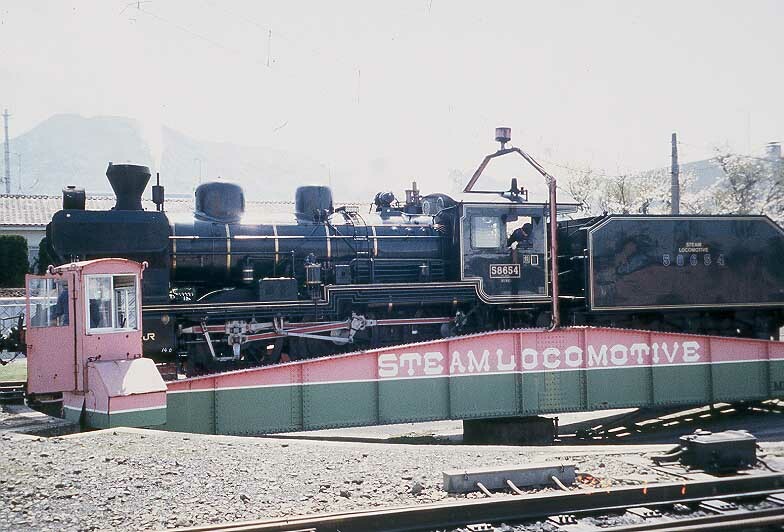 It was operated at weekends & holidays. Journey time was 154 minutes from Kumamoto and 115 minutes from Miyaji. 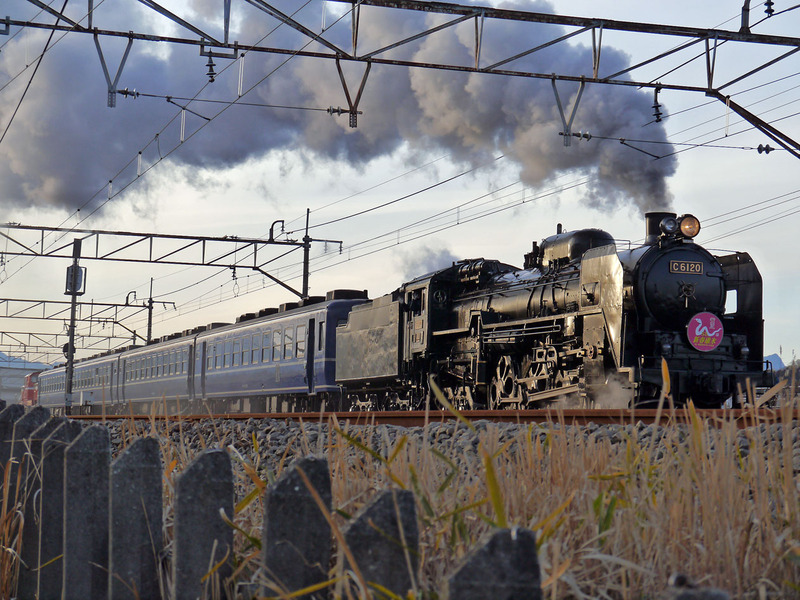 Steam train Aso Boy behind steam engine 58654 at Kumamoto. 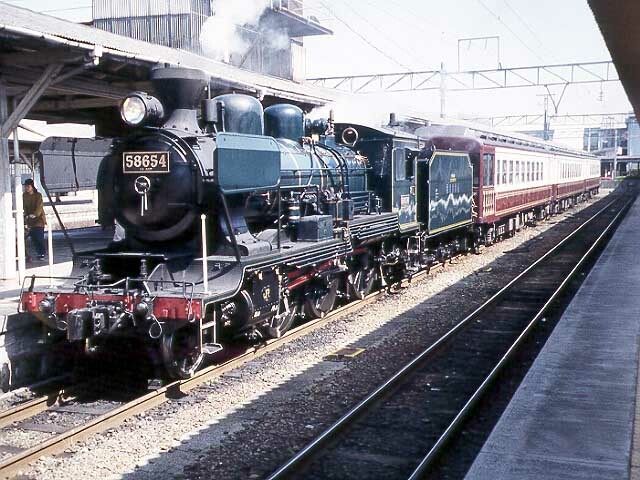 A side view of steam engine 58654 on a turntable at Miyaji. Asoboy waiting for return work at Miyaji.